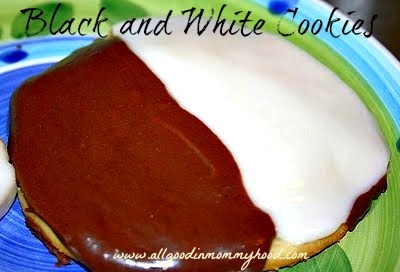 Black and White Cookies fly under my radar. I never think of them until I am in a bakery and I see one, fresh and plump, staring me in the face. They remind me of a cake, but in cookie form. They have their own consistency, their own personality. They are also the kind of cookie that one of my munchkins sees and they MUST have it. And so I buy them one and they eat 1/4 of it because its too big. And then I eat the remaining 3/4 they didn't eat. Which is why I bought the cookie in the first place. I was banking on at least 1/2 of it coming my way. Since the sun hasn't shined in two days I decided to bake my rainy sorrows away. These cookies are every bit as good as they look. Heat oven to 350. Cover baking sheets with nonstick aluminum foil. In medium bowl, combine first 3 ingredients. Set aside. In large bowl, blend butter and sugar until creamy. About 1-2 minutes. Beat in egg. On low speed alternately add flour mixture and buttermilk, beginning and ending with flour mixture. Drop dough by 1/4 cupfuls onto baking sheets, spacing approximately 3 inches apart. Using spatula, gently spread each cookie into a circle (approximately 4 inches across). Bake at 350 for 10-12 minutes. Check cookies at 10 minutes to make sure edges aren't browning. These cookies taste best if they are light in color and soft in texture. Crispy edges will be the demise of your cookies. Allow cookies to cool thoroughly on wire racks. In medium bowl, stir together sugar, 3 tablespoons milk and vanilla until smooth but thick enough to coat cookie. Set aside 1/2 cup icing in small bowl. Add cocoa powder and remaining milk and stir until smooth. GENTLY ice cookies using spatula. Using one flavor of icing, drag icing down one side of cookie. Carefully coat the one side and make a straight line down center. Repeat with other flavor on opposite side of cookie. Once all cookies are frosted let them set on flat surface such as cookie sheet or wire racks for at least one hour. First Babies, Last Babies and Everything in Between. Last week I had kindergarten screening for my last munchkin. What a smack in the face. I sat in a room with a few other mothers, and a teacher came and whisked away our babies. We had to wait for an entire forty five minutes while they grilled our cherubs on the alphabet, counting and heaven knows what else. I wished I brought a magazine. One of the mothers was anxiously wondering what they "tested" them on. She wanted to know what they were doing in that classroom out of our view. It was obvious she was uncomfortable not being involved; she was definitely used to being in the "know." Seeing her question the other parents in the room, it occurred to me that I didn't think much about it at all. I knew this was her first child entering kindergarten. With my first, I remember desperately trying to understand every minute of his day away from me in kindergarten, with my second I didn't wonder quite as much. With my third? I bought him a new Webkinz and when he got off the bus, I was just so happy my buddy was home. All of this had me realizing the many differences from my first two and my last two munchkins. Bless all their tiny, adorable hearts. My first two babies are achievers. They're more serious and I tell them much MUCH more often to relax. They raise my blood pressure with their moods and they take much more to heart than the kids lower in the pecking order. They worry. They think. They just have a more pensive approach to things that sometimes works in their favor. Sometimes it doesn't. My third baby, is all about living. He jumps into every day head first and gets the party started. There is much less caution and much more doing. I imagine this mirrors what he experienced with me as a mom when he was a baby; I wasn't afraid anymore. I jumped into everything with more confidence than I did with my first two kids. My third carries much less around with him mentally, and can brush off much more than my older two can. All of this "living" is certainly a breath of fresh air at times, and at other times I'm just afraid to let him out my door for fear of what might happen. My last baby has much more of my third child in her, with a tendency to just be happy and go about her business. Although she's much more cautious with new experiences, which is very welcome considering her older brother is constantly giving me heart attacks. I do wonder how much of their behavior is a result of my behavior when they were young. How much I catered to them, praised them, pressured them and watched them. I sat with my oldest every afternoon practicing the alphabet before he went to kindergarten. Yet I was petrified to let him on that bus. I drove him every day instead. The only reason my second rode the bus was because her brother was on it. My third? Bus rider. And the only alphabet lessons he got was from his older sister when he had to sit and play school. Same goes for #4. The world is full of first babies, second babies and babies born with many older siblings. The older we all get, it becomes less obvious who is who because the world has a way of shaping us. But I love how different my babies are, and I still cautiously learn with my oldest while sign papers without a thought for my youngest. My sweet first baby will always pave the way for me and his younger siblings. Amen and oh crap. All at once. I'm just feeling blessed I get to experience first, second, third and fourth time mommy-ing. Every child has brought me a new adventure. Happy Monday all. Make it awesome. 1. We have a stray farm cat that hangs around our house. I'm not a cat person (allergic since I was a kid) but this cat is a love. She has had two litters since we moved in a year ago, and I'm pretty sure she's cooking her third. I'm on the lookout for a free clinic to have her fixed. Until then, we feed her and the kids get a kick out of our outdoor "pet." She's even become a regular on my Instagram feed. 2. I've been super busy with baseball lately. And loving it. Two boys playing real ball this year has put our family into a baseball craze. 3. Gymnastics is ongoing, and we have states in a few weeks. 4. I got a job! I'm super excited to announce I'll be a unit desk clerk in a maternity ward in the coming weeks. I'm also super nervous about adjusting to working part time and shuffling munchkins. I also can't believe my baby is going to kindergarten and I'm at the time in my life where I'm ready to work part time. Somebody pinch me and tell me where the heck the last five years went. Borax. Who ever knew it was so versatile? A few years ago, my oldest son brought home an instruction sheet on making homemade snowflakes. Well, he was in first grade so it was "several" (waaaaaa! sniffle! Seriously he's almost a teen!?!) years ago. Anyway, you needed Borax. I bought a box, and my cleaning world changed forever. Not only did I make a snowflake with my son, I cleaned toilets, deodorized sinks and freshened laundry. Borax is similar to a box of cleaning magic. It's a safe alternative to bleach and harsh cleaners and it's cheap! While it should NOT be ingested, Borax is a naturally occurring mineral also known as sodium borate. It doesn’t cause cancer and it is not harmful to the environment. In other words, it's awesome and you need a box STAT. If you are interested in snowflake making, which you shouldn't be because it's Spring, about.com has the instructions. In no particular order, here are some of my favorite uses for Borax. 1. TOILETS! I sprinkle some in (about 1/2 cup) and leave it overnight. The next morning swish and scrub, and when you flush that toilet it will be clean (sparkling!) and stink free! This is my absolute favorite use for borax. My kids are not avid toilet flushers which leads to stinky, urine smelling toilets! 2. Carpets. Dissolve 1/2 cup of Borax in a pint of water and sponge it onto stains, wait 15-20 minutes and "rinse" with a wet cloth. Let it dry and vacuum. 3. 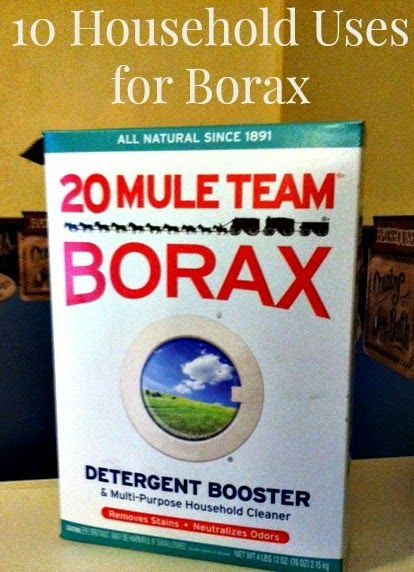 Add Borax to your laundry. Just a 1/2 cup with freshen the clothes, help remove stains and boost your detergents cleaning powers. If you have some tough stains, pre-soak! Borax naturally softens hard water too! 4. Sprinkle 1/4 cup Borax into the bottom of your dishwasher to help with spots on dishes. 5. Stinky garbage disposal? Add 3 tablespoons Borax and let sit at least 15 minutes. Flush with water while running disposal. 6. Using a clean sponge, scrub your counters and appliances with a sprinkle of Borax and some water. 7. You can use Borax to clean your patio furniture, garbage pails and microwave. Dissolve some in warm water and scrub! 8. FLEAS! If you have pets, and you suspect fleas, sprinkle borax wherever you think those fleas are hatching (pet beds etc). Borax would need to be ingested in VERY high doses to harm a pet, but it releases a poison that kills fleas. 9. Showers. Use with a sponge just as you would a powder cleanser and rinse thoroughly. 10. Unclog drains. Pour 1/2 cup borax down the drain and follow with 2 cups boiling water. Let sit for at least 15 minutes, then flush with water. Any else have some helpful Borax tips I haven't listed? Share with me! Happy Wednesday! School project. Science fair. Home on a rainy afternoon. Bored on a hot summer day. Home Schooling Science. Playdate entertainment. I love these volcanoes because they don't take much from around the house and the kids can help easily. You'll need a small container to start your volcano, think shot glass size. Anything you can throw out or clean works just fine. You know those small plastic containers with lids for a side of dressing? Those will work too. If you desire, grab some clay from the craft store or just use dirt/mud from outside. Sculpt your volcano using the mud/clay/etc. Place on a plate, and help your kids add one tablespoon of baking soda to the inside of each volcano. Add a few drops of red food coloring. Finally, give your kids a small glass of vinegar and tell them to pour it inside their volcano...and it "erupts!" Obviously you can be extra crafty and make bigger more elaborate volcanoes or just use the container and an imagination. The choice is yours. 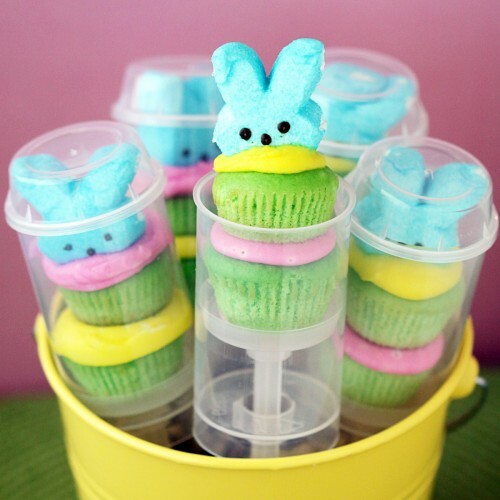 With Easter on the brain I want to share my current favorite "Easter-anythings" from Pinterest and around the web. 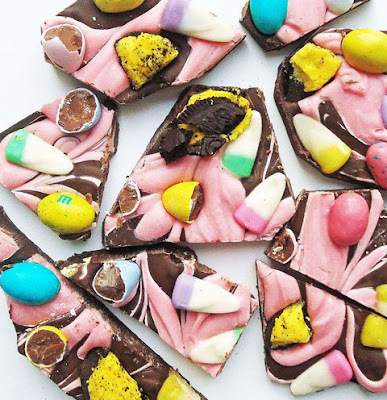 You'll love all these cute ideas to experiment with and keep you busy this weekend. My kids are off from school the next several days and I plan on getting into the Easter spirit with some crafts and egg coloring. Here's to cracked eggs and colorful fingertips. For moms of little ones, check out this super cute "memory" snack idea from Dirt and Boogers. 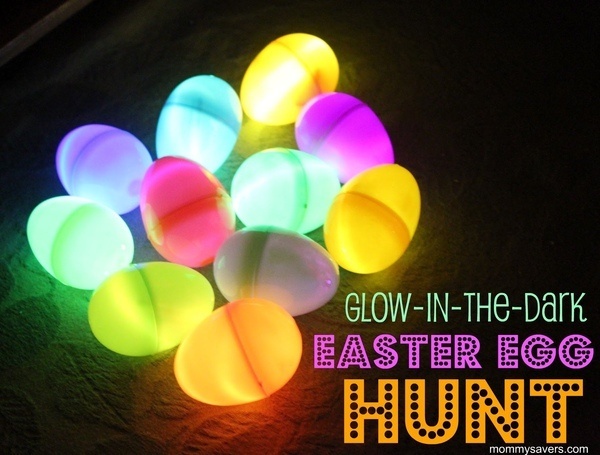 Using plastic Easter eggs, this blogger created a great game to make snacktime fun. I love these natural, non-toxic eggs from Craftgawker. Boil and grab a white non-toxic white paint pen. Co classy! 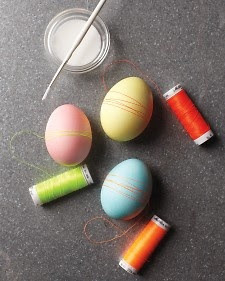 How about these Easter Eggs, by Martha Stewart Living? Make your own Easter Egg Tree Craft (supplies are just about $1 each!) by Sweet Floweret. I would love to try this easy (and healthier!) 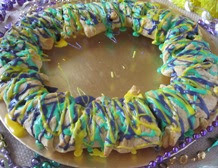 King Cake by Healthy Cooking Blog. That's all folks, for now anyway. Little League season has officially begun. Practices four to five nights a week (x2), scrimmages, pictures, snack stand obligations and games have taken over my life. As if competitive gymnastics wasn't enough. Tonight, my younger son (LLG) was out in full force. Dressed for his first game, and batting lead off, he was pretty stoked. The weather was gorgeous except for the gusting winds that have ruined every perfect weather day so far this Spring. Still, I'll take it. I'll also take a 0-1 loss, because the kids played hard. At the end of the day, that's all that matters. None of us will remember scores or how many strike outs our kids had ten years from now, but we'll remember the teaching moments. The little ones that make being a parent the best and most important job in the world. For me, Little League is all about those moments that tug at my heartstrings and make me want to hug the disappointments away. It's about the moments that have me leaping out of my seat with pride. Those are the ones that offer all the lessons; how to win with class and how to lose with your head held high. The world needs kids (and parents) who can do both. Tonight we lost the game with the tying run on third. Sometimes, that's the way the cookie crumbles. Those trophies at the end of the season aren't for winning; they are for sticking it out through long practices and tough games. They are for participating, and they are tokens of a job well done. As for us parents, keep it in perspective. If our kids are lucky they'll experience being on winning teams, losing teams and everything in between. Every kind of team offers different, and necessary lessons. Just be happy your kid is out on that field and off an xbox, ipad or cell phone. They're learning about how to play on a team and be a good teammate as they round those bases. It's our job to help them on their journey as they navigate their way through ups and downs on that field. Not every kid will play every inning, not every kid will catch the ball. How we treat, coach and parent those kids says more about us than our record at the end of the season. In our house, it's one game down, I don't even know how many to go. And I'm looking forward to every nail biting one of them. Happy Little League season to all the other Mamas living the crazy. Cheers to the big hits and amazing catches. Live it up and love your little players! I'm buried in tax return fun over here, and for the first time since the 1st year I was married we OWE the Internal Revenue Service. It's just the final kick in the pants that is 2013. To move from New York to Pennsylvania we had to cash in retirement savings, because we were underwater on our house in New York (we bought at the height of the housing market in 2007). Rather than lose thousands on our New York house, we found a fabulous renter. And we bought another house in Pennsylvania. We're now landlords that live in our 401K. Make sense? To make a very long story short, the IRS doesn't care about any of this. They just want their money. I call this the final kick in the pants that is 2013. This time next year, we should be paid up and continuing on with our journey that constantly brings surprises. I'm so very thankful for all the blessings in my life, they make days like today not so bad. I have what I need. The rest is just fluff. Happy Friday all, remember what's important this weekend. If you're running to the post office on April 15th, I'm with ya. Houston, we have a problem. Kids don't like veggies. In all seriousness, I know many kids who don't eat their vegetables. Any vegetables. Pretty scary stuff. While my kids aren't the most adventurous eaters, we love our steamed broccoli and our carrots with low fat ranch. We eat salad and celery. It's not so bad, but I'm always aiming for improvement. With sports and school and homework and whatever else is happening 'round these parts, family dinners are super hard to come by. The few days we have the time I don't have the energy or supplies to prep a complicated, time consuming meal. I've found two products I am in love with, literally. Add them together with Teriyaki sauce and you have a kick arse meal. Birds Eye makes frozen vegetables in bags that you just toss in the microwave. They steam right in the bag and in minutes you have vegetables. While broccoli is the family favorite, I've discovered the Asian Medley. Wowzers. The vegetables are lightly seasoned and you could literally eat them out of the steamed bag. If there is one thing kids love it's new funky foods (well my kids anyway). All I had to do was show them tiny corns and they were game. The other product I've been crushin' on is precooked, preservative free chicken strips. 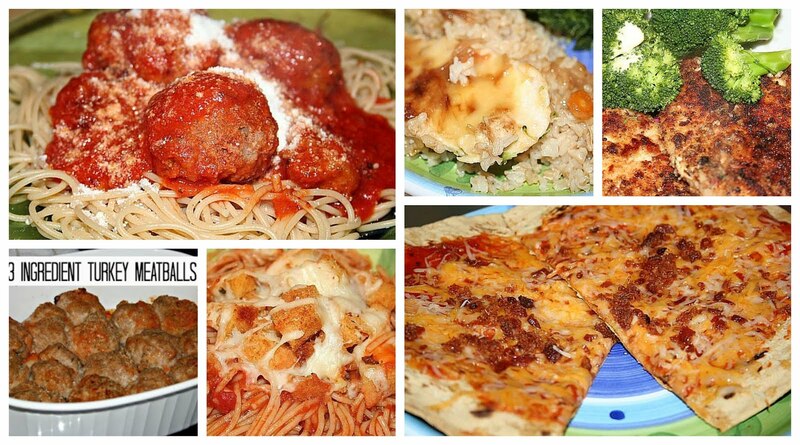 Tyson makes them and they are super easy to toss in the pan and make quick on busy nights. Chicken strips, Birds Eye vegetables and Teriyaki sauce are all you need to make my current favorite dinner. When chicken is cooked through (or un-frozen) add steamed vegetables and toss with Teriyaki sauce. You can of course add brown rice, but if you decide against it you have an incredible meal that is under 200 calories and has 19 grams of protein (that is 1 cup vegetables and 3 oz grilled chicken). Amazing. A bonus? My kids gobble this meal up. If you have picky eaters, stay away from the fancy vegetables and try chicken and broccoli stir fry. If you have really picky eaters set aside plain chicken strips and broccoli before you toss with the Teriyaki and serve with barbecue sauce. Or ketchup. Easy variation that keeps you from cooking three different meals for one sit down dinner. This is my child enjoying the chicken, broccoli and barbecue variation. In a princess dress because we "dress" for dinner (not). Tell me some of your go-to vegetables and recipes! I'd love to hear them! Lately I've been on a quest to buy more natural organic foods and less processed, chemical-ly (new word alert!) foods. After seeing Jillian Michaels I decided it was time to make some long term changes. Long term changes for me can't include banning any foods in particular, I'm more of a small steps girl. If I can find a few organic, non GMO foods my kids enjoy in their lunches and after school I feel it's a win. My goal is less chemicals for everyone. We can still enjoy the junk, but I'm trying to move us all in the direction of MORE natural foods and LESS chemicals. I've found a few great lunchbox items (Kashi Strawberry Ripe bars, Annie's Organic Chocolate Bunny Graham Crackers) that have been a success. For the record I've found and purchased as many items that were met with disgust. It's a process. Instead of buying cookies with an ingredients list I can't even read, I'm making homemade whenever possible. My theory is that I know what's in the cookies I make. I can list on my fingers the ingredients and there is nothing unnatural tossed in "for freshness." I made these Whole Wheat Chocolate Chip Cookies yesterday, and they are a bonafide, kids-love-them hit. All you need is one or two, and you're satisfied. I promise. I make these with 1 1/2 cups whole wheat flour and a 1/2 cup all purpose flour. If you struggle with the whole wheat texture in cookies, try 1 cup all purpose and 1 cup whole wheat. I've made these for parties with the 1 cup white 1 cup whole wheat and no one even notices the whole wheat in there. If you're really looking to amp up the health factor try all whole wheat flour or throw in some milled flaxseed. With mixer, beat butter on low until smooth. Add sugars and beat on medium high speed about 2 minutes, until creamy. Scrape sides of bowl and add egg and vanilla. Beat until light and fluffy (about 3 minutes). 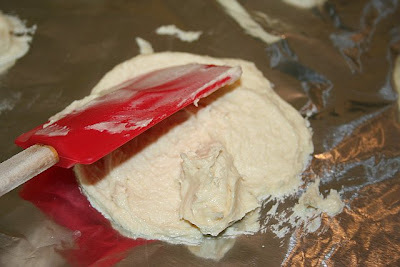 Turn mixer to LOW, and slowly incorporate the dry ingredients. Mix until JUST combined. The batter will be VERY thick. Stir in chocolate chips. I use an ice cream scoop to drop batter, two inches apart, onto ungreased cookie sheet. Bake 8-11 minutes, remove from oven when centers are still soft and gooey and leave on cookie sheet 2-3 minutes for cookie to set before transferring to wire rack. 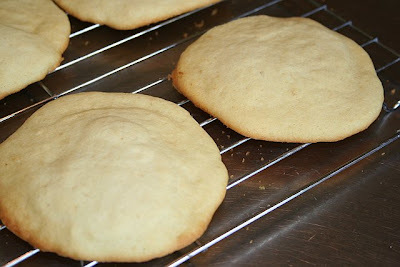 These cookies need to be removed from oven before edges are too brown or you will have a very crispy cookie. Store in an airtight container and enjoy within 3 days. Or, freeze them and toss one in a lunchbox every morning. By the time lunch rolls around they will have a fresh cookie. Enjoy! Makes approximately 24 cookies. Ever since I can remember I've been plagued with allergies. From animal dander wheezing to seasonal itchy eyes, I enjoy it all. While it's easy to avoid animals like cats and rabbits, avoiding all the blooming plants in Spring is another story. I love to get my yard "de-wintered" as soon as the weather turns. The sun comes out and I spend hours in the yard pulling weeds and planting flowers. I take trips to local nurseries and buy new plants and flowers for the yard. I love to coordinate colors and arrange where all my new plants will look best. It takes me weeks. Trouble is, ever since moving to the country, my entire family has experienced new symptoms from plants and animals we've never been around much before. Last Spring was pretty interesting. We have a farm right across the street, and there were grasses and trees blooming all around us. There was also the scent of manure (that took some getting used to) and the sound of cows in the morning. To say some of us were suffering from the change in environment would be an understatement. I never knew my younger son had any allergies at all until we moved, and the poor guy had to wait a week to see a doctor when his eyes started getting red and watering. I realized we were dealing with something that required attention when his face swelled so badly he had to manually open his crusted eyes in the morning. While he was uncomfortable, he did get out of family yard work, so it wasn't a total loss (for him anyway). Luckily, I tend to get a scratchy throat when I'm a allergic to something, not a swollen face. Unfortunately, I make this God awful noise to "itch" my throat. My brothers do it too. It sounds kind of like a frog and I'm told it's pretty annoying. I spend hours in the yard, suffering and sounding like a frog. I tell my Hubby I can't help it and he just rolls his eyes. My favorite itchy throat helper is HALLS Creamy Strawberry Breezers. Have you tried these amazing little cough drops? They don't have any of that yucky cough drop taste. I keep these by my bed and in my purse, and they work magic on my itchy Springtime throat. Hubby and my kids are extremely thankful there is something that can stop the frog noise. I'm just happy my throat isn't on fire all day long in the Spring. If you suffer from seasonal allergies like I do, I highly suggest you give HALLS Strawberry Breezers a try. They are even excellent in the winter when I have a cold. I keep them on hand year round. Happy Spring everyone. Wishing all the allergy sufferers like me a minimally annoying season. Cheers! Spring has sprung. Thank heavens. Along with Spring comes blooming flowers, singing birds, longer days and one of my favorite Springtime visitors; the Easter Bunny. Disney released an all new movie, straight from the world of Peter Pan. The Pirate Fairy is now available on Blu-ray and Digital HD. I'm a huge fan of a new movie in the Easter basket, and for my four year old Disney fairy fan, this is the perfect selection. Along with the movie, I found Pirate Fairy coloring sheets on Pinterest's Disney Pirate Fairy Board. I also found mazes, match games and more for my little one to enjoy this Spring. If I print them out, roll them up and tie them with a pretty ribbon, I have a free basket stuffer that will keep her busy all afternoon. 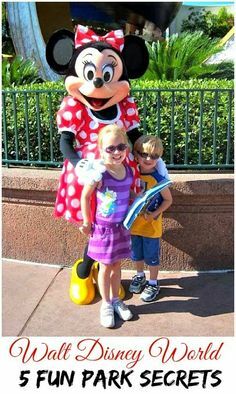 If you need activities for your Disney loving kids, be sure to follow the board! Pinterest is my favorite site to check when I need just about anything. I love finding pins with ideas that make my life easier, such as the Pirate Fairy coloring pages. On parenting boards I've found great tips for birthday parties, quiet days at home and more. It sounds silly, but sometimes just being on Pinterest encourages me to do more at home. Its hard not to be inspired when you see all the creativity coming from parents all over the world. If you're looking for a few boards with Easter related pins, Crafty 2 the Core; DIY Galore is my favorite board for do-it-yourself anything. 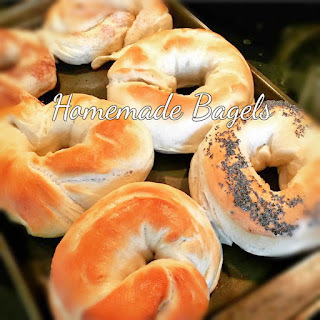 Every day I find excellent tips, recipes and crafts. Recently I've seen some unique Springtime recipes and crafts for the kids. When the Bunny Visits is dedicated to Easter everything, and I'm in love with the egg decorating, baking and do-it-yourself projects on that board. My kids will go crazy for all the egg decorating fun I have planned thanks to this board. Check it out! For my Disney fans, another Pinterest board I highly recommend is Oh My Disney. I love reading and sharing with my kids the tidbits of information on Disney movies and fun Disney themed posts such as "Life Lessons from the Jungle Book." My Disney Board (which you all should already be following...*wink*) has my favorite Disney World posts, everything from tips in the parks to fun quotes. I'd love for you to share your favorite Pinterest boards, I'm always looking for a good follow! There is so much to explore in Disney World that even if you go every year (like us) it never gets old. This post is intended to share some of the little known tricks and tips many families either pass up or just don't know exist. I used "secrets" in the title because "little known tips and tricks" was just too lengthy. I could share dozens, but we'll stick with my five favorite under-explored or underused gems. 1. If you are a Disney Visa Card or Debit Cardholder you have access to a private meet n' greet in Epcot at the Innovations West Pavilion from 1pm-7pm. Along with meeting some of Disney's most popular characters you receive a complimentary 5x7 photo too! Just flash your Disney card for access to this super cardholder perk. 2. While you're over at Innovations West, don't pass up a visit to Club Cool. Club Cool is sponsored by Coca Cola, and while you're there you can try free samples of popular soft drinks from around the world. This is a great pit stop if you're waiting for other members of your party after a long day, or just to recharge the family batteries. 3. From Epcot, you can walk to Hollywood studios. Yes, this is fabulous information for park hopper ticket holders. There is a back entrance into Epcot located between France and the United Kingdom. The walkways take you to the Beach Club, Boardwalk and onto Hollywood Studios. If this walk is too long there is a boat as well. 4. There are "Public Phones" in the Magic Kingdom, one in Tomorrowland by the Astro-Orbiter and one on Main Street USA. If you pick them up you can listen to entertaining conversations! 5. In Hollywood Studios, on Streets of America (New York Street to be exact) there is an umbrella attached to a streetlight. If you step underneath and step on the black square, it "rains!" Great photo opp! Have any Disney Secrets or tips to share? I'd love to hear them! Ever since seeing Jillian Michaels a week ago, and listening to her stress how many chemicals we all come in contact (and ingest) every day, I've been on a mission. It's not a huge mission, I work much better in small steps that don't require major changes. My kids do as well. Every day, I'm trying new things and new foods that are chemical free. I would never be able to announce "We're all eating organic, all natural foods from here on out..." I would never be able to afford it either. It's all about baby steps. My goal is to get all of us eating and exposed to LESS chemicals than we were before. So far I've found one snack bar my daughter LOVES, a pudding my other daughter loves and laundry detergent that was on clearance. As I find more tried and loved chemical free and affordable products, I'll write a post and share everything we personally "approve." Today, I'm sharing with you all the powers of Distilled White Vinegar. Cheap and amazing. My kind of product. 1. Vinegar kills grass and weeds growing in those hard-to-reach spaces such as walkways and in between patio stones. No chemicals needed, just pour undiluted vinegar until the roots are dead (may take a few applications). Hurray - no more Round Up! 2. Summer is a time of sun, swimming and sandboxes. Keep cats (and their um, piss) out of your sandboxes with white vinegar. 3. Vinegar eliminates anthills. I've stepped on dozens and can't wait to vinegar the crap out of them this Spring. 4. 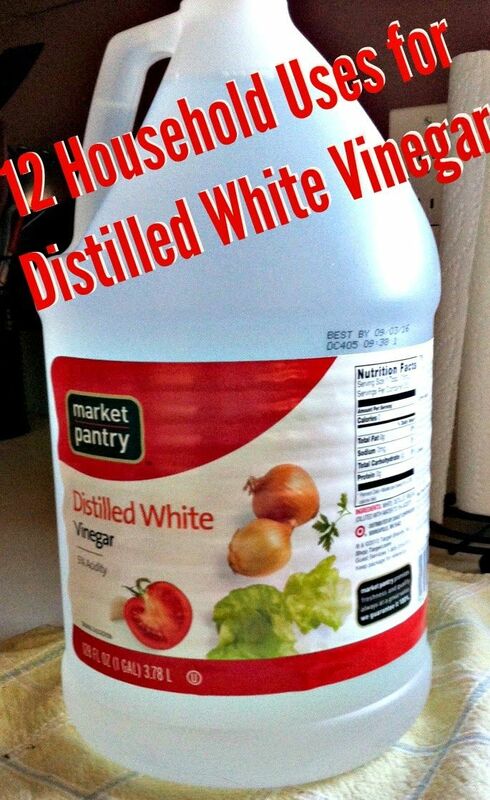 Wash your vegetables in white distilled vinegar. Combine one tablespoon vinegar to 1 1/2 quarts water. 5. Smelly kitchen drain? How about bathroom sinks? Pour one cup baking soda followed by one cup hot white distilled vinegar. Let this sit for five minutes and flush clean with hot water. 6. White distilled vinegar is an excellent ant repellent. Spray undiluted vinegar outside doors, windows and around all the cracks and crevices you find ants. 7. A small dish of distilled white vinegar will rid your kitchen of fruit flies. 8. Make your own floor cleaner: mix a solution of 3 drops dishwashing liquid to 1/3 part white distilled vinegar, 1/3 part alcohol, and 1/3 part water. Spray sparingly and mop away. 9. Keep your clothes lint-free (and soft!) by adding 1/2 cup of vinegar to the wash cycle. 10. Vinegar is a great antiseptic for cuts and scrapes. 11. Want fresher breath and whiter teeth? Who doesn't? Twice a week brush with white distilled vinegar. 12. Stop insect bite stinging and itching with a cottonball soaked in white distilled vinegar. Do you know of any I missed? Share with me!